“Every October, the freshmen at Glenville State College are told stories about Sis Linn, the local ghost who haunts Clark Hall and the graveyard where she’s buried. Murdered in 1919, she was beaten beyond recognition, the target of a brutal killer who was never caught. 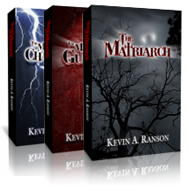 In The Matriarch, Kevin Ranson interweaves real and fictional horror into a tale that is part mystery, part supernatural – and entirely hypnotic. Full of rich characterizations and settings, Ranson draws an original picture of the vampire – one that reveals its secrets as it plays on your senses and sympathies. You might be concerned…that The Matriarch could spin into the arena of Young Adult fiction –- It is not. Indeed I was struck, within the opening pages and an evocative visit to a church, by the accurate impression that this was certainly a horror novel and the author maintains such a line and also maintains a line of vampires as pure creatures of the supernatural… the character Ian reveals himself to be nicely twisted. The best compliment to the book…it kept me interested, the prose was crisp and I actively wanted to return to the book. The Matriarch is yet another story that manages to breathe new life into a seemingly tired and played-out subgenre of horror…a wonderfully and skillfully crafted vampire tale that shows respect for the classic monster, while still changing things up in a way that shows the author’s personality and individualism. I’m very happy that I got a chance to read it and that I can share it with other horror fans because I think it is something that they could really (I CAN’T RESIST) sink their teeth into! Ranson has effortlessly merged a mystery thriller with the allure of a vampire horror story… a cleverly written thriller/horror that banks on the idea that well-developed characters with a sense of humor are the key to a great piece of fiction. … a believable, creative vampire story. I loved the descriptions of the area and the idiosyncrasies of native WV people. I’ve read several vampire series and all have some basic similarities… many are really far reaching in their story lines, but The Matriarch was believable. The characters were well defined, and the descriptions were vividly realistic. Overall, a very good, very well written book.